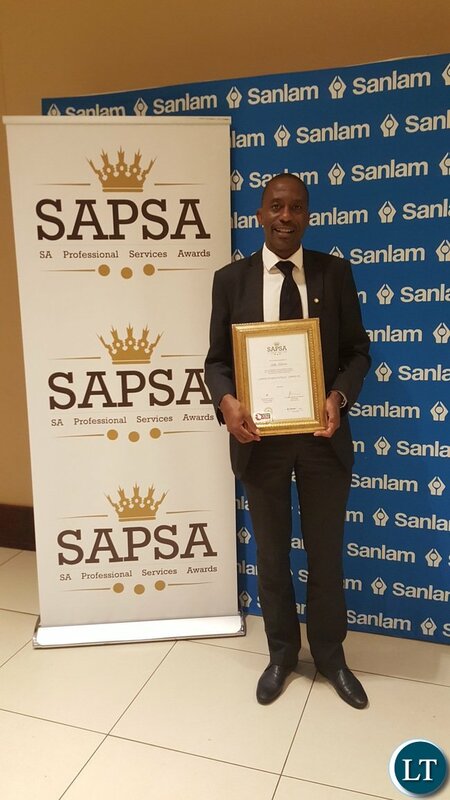 A ZAMBIAN, renowned for some landmark architectural works both in Zambia and South Africa has emerged 2016 second best architect in South Africa after being conferred with the honour by the South African Professional Services Awards (SAPSA) last week. Mr. Kelly Kalumba, who has been practicing in South Africa, was selected second best from among two other finalists for the Professional of the year in the ‘Architecture Class of the Built Environment’ category at an awards presentation ceremony held at Monte Casino in Johannesburg on 3rd November, 2016. Mr. Kalumba reached the last three from more than 2, 500 nominees selected in March this year when the competition started. The finalists, including Mr. Kalumba, where each presented with a framed and duly signed certificate and a custom made trophy. The 46 year old has, since 2003, been Senior Partner at Louis Karol Architects in charge of the Johannesburg office taking care of projects on the continent, including the re-development of Society House on Lusaka’s Cairo road. 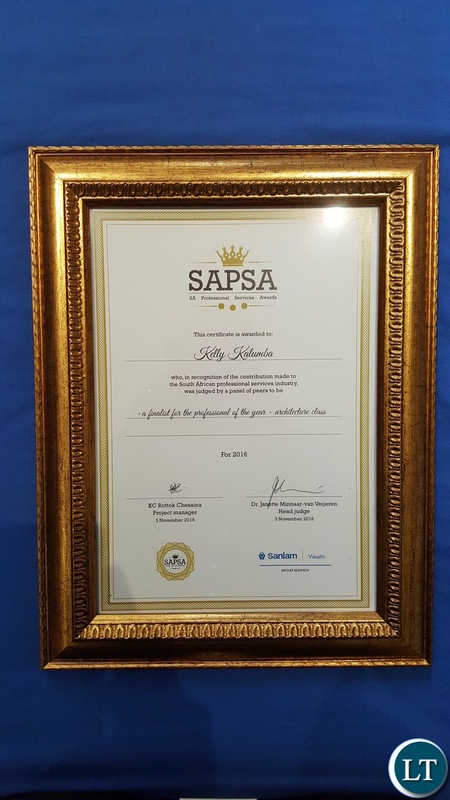 SAPSA seeks to recognise individuals and organisations that have excelled within the South African Professional Services Industry. The process undertaken to identify nominees, finalists and eventual winners started in March, 2016 with a call for nominees for the various individual and organisation awards directly to professional service firms as well as to the South African business community. Awarding of companies was based on business growth, customer service, technical excellence, contribution to the community, contribution to the profession, transformation record and commitment to ethics and professionalism. The criteria for individual awards, to which Mr. Kalumba was subjected, included demonstration of management and leadership qualities, success of the units headed, innovation within the bounds of available resources, mentorship record, passion and drive, personal values, notable career achievements, concrete future objectives, embracing lessons from challenges, breaking of new ground, taking of risks and changing paradigms, standing out among peers and making a difference. The judges found Mr. Kalumba to be an individual who epitomised the two aspects needed to be a good professional services leader namely good technical skills as demonstrated by his exploits in architecture and good management skills as proven by his taking charge of a new Johannesburg office for Louis Karol Architects. Mr. Kalumba has been a project architect for well-known structures such as the V and A Waterfront Shopping Mall in Cape Town; the 2010 World Cup Stadium in Cape Town; Liberty Life Regional Headquarters (Office and Hotel) in Umhlanga, Durban; Gautrain train stations (Midrand, Centurion and Pretoria), and Nkwashi Mixed Youth Development on Leopards Hill road in Lusaka where10, 000 houses, a university, international boarding school, retail and office park are being constructed. Others include Essex College in the United Kingdom; Crown Street up-market residential apartments in Glasgow, Scotland; extension to the Birmingham International Airport (with bussing facility); Seacon up-market residential apartments on the River Thames in London; Eco Towers (office development) in Accra, Ghana; Intercontinental Hotel at OR Tambo International Airport; The Zone Shopping Mall in Rosebank, South Africa; Jabi Lake Mixed Youth Development (offices and hotel with residential complex) in Abuja, Nigeria, and Onomo Hotel in Free Town, Sierra Leone. Congrats Kalumba. My child also wants to follow in your footsteps by being an architect. Vi ma UPND will be pi$$ed – ma! I know that we are good in all professions. Our only weakness is we allow id!ots to run our political governance. Good for Zambia and your family in particular. Congrats. Stay where you are though and don’t accept any political appointment from ZAMBIA or you will be finished like our Mvunga. Because ourselves we can’t govern properly, too much money, too much quarreling, too much pompous. But its true we are geniuses. Well done Mr Kalumba. I am very happy when Zambians get famous for good things. @zedoc how can your child follow in Kalumba’s footsteps when you are in ZEDOC and the Architect is in South Africa! Have you ever heard of an Architect practicing in Zambia winning such an award! Even ACCA- only ba mwisa are excelling! CONGRATULATIONS AND HATS OFF MR KALUMBA AND KEEP IT UP SIR. Eya! Wakwesu! Well done mwata! Zambian professionals do well in our individual careers when transplanted to the right conditions. Wherever in the world a Zambian professional is they are top of their game. What we lack is the ability to self organise and turn our country into the right conditions. Well done Kelly….You inspire the whole lot of us to aspire for greatness…Well done! What is of note about Zambian professionals is that we have the skill but no professional opportunity back home. This is different from a lot of environments where skill is compromised for expediency (if you look closely at SA pass rates you will know what I am talking about). So the Kalumbas, the Dambisas, the Mwendas and many more making a mark in the world outside their native Zambia is testament of how little we need to do to get things right right back at home! Congratulations again, Kelly! Congratulations my bro! Our uncle blaze,may the Lord continue to bless the works of your hand. Congratulations Kalumba! Flying the flag for mother Zambia. I bet he’d have won if he was from South Africa. On a side note why do some people have to politicize everything? Can’t we just celebrate someone’s achievement without resorting to political parties? People let’s focus on being positive and moving forward. It gets tiresome. Not everyone comes here to make political statements. It’s impossible to avoid making political statements when the situation demands so. How do you keep quiet when the country is headed by a heavy drinker and dishonest president whose govt is managed like a criminal Mafia organisation? Do you just look the other way when the ministers are shredding the economy to pieces? If you are able to relax amid such chaos you aren’t a true Zambian. Yes,but you’re on the wrong platform to be making political statements. This is about an individual Zambian doing well. Let’s not turn this into politics. If you want to discuss politics why don’t you do an intelligent thing like start petition of the things you’re unhappy about. Otherwise like an empty can you will just making noise for those of us who are not interested in hearing your noise. Congrats Kelly! We were intake mates at Hillcrest Senior Technical Secondary School many years ago, and contemporaries at The Copperbelt University (CBU) later on. Bravo once again!!! @Fuehrer what awards have you won? First Among Equals perhaps! This is so inspiring and motivating. One up for Zambia!! !, we celebrate with you on this milestone. Congratulations Mr. Kalumba! I’m inspired. CONGRATULATIONS MR. KAYUMBA. YOU HAVE ZAMBIA PROUD. MAY GOD CONTINUE TO BLESS YOU. WHAT NOW SURPRISES ME IS WHY CERTAIN COMMENTS SHOULD TAKE A POLITICAL AND TRIBAL STANCE! Congratulations for doing yourself and Zambia proud. Keep shining! Congratulations Mr. Kalumba. Sir keep it up. And Motivate our young Zambians to be determined and achieve such awards. Congrates Sir.